Click on one of the main categories below for questions and answers in that category. Do I need experience at handling a boat? No. All of the cruiser companies we represent provide full tuition when you first take the boat, and will stick at it until you're happy that you can handle the boat. Do I need a licence to drive a boat on the Shannon River? No. At present no license is necessary to drive a boat on the river. Can I hire a boat for less than a week? Yes. Most (but not all) of the companies will let a boat for a period of three or four nights. These short breaks are subject to availability and usually can't be booked until two weeks before the cruise is due to begin but some of the larger companies are more flexible. Prices for short breaks vary from company to company - please contact us for a quote. What's the minimum age to hire a cruiser? The minimum age to hire a cruiser 21. Yes, but your choice of boat is severely limited by taking a pet on board as most of the cruiser companies don't allow it. Those that do allow pets will charge a fee of €35-€100. What are the collection and return times? Seven nights is really six and a half days as the boat can be collected from 16:00 and must be returned by 09:00 on the last day. For short breaks most companies will allow a 14:00 collection. Can I hire a boat at any time of year? No. The cruiser companies operate from March to October only and there are no boats available over the winter. Yes. There's free car parking at all of the marinas in Ireland with the exception of the Emerald Star marina in Portumna who charge €4 per night to park a car. This parking is not supervised at night but the crime rate is very low in rural Ireland and we have yet to hear of a car being interfered with at any marina on the river. Payment terms with all of the cruiser companies is 33% of the boat hire fee to confirm the booking and the balance is paid six weeks before the cruise is due to begin. For short breaks the full hire fee is required to confirm the booking. 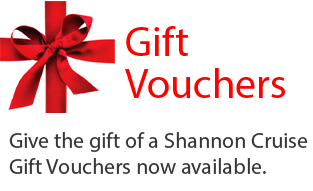 At Shannon River we can take payment by credit card online or by phone, bank transfer or cheque - cheque payments should be made at least six weeks before the cruise is due to begin. You can send your card details with the booking form that we send, or we can take it over the phone. You can also make a payment online in our customer area, we'll send login details when you book your boat. Our bank details are available on the booking form. Two costs to bear in mind are the refundable damage deposit and fuel. Refundable damage deposits vary from €500 to €2,500 depending on the boat and are paid directly to the cruiser company when you arrive using cash or a credit card. The damage deposit is fully refunded when the boat is returned undamaged. Many companies offer a damage waiver instead of the deposit - this is a smaller amount than the deposit but is not refundable. The main difference between the two is that the amount you pay is the maxumum amount you're liable for should the boat be damaged. You'll find more information with the listing for each boat. The smaller boats use around 3 litres of fuel per hour and the largest boats can use up to 10 litres per hour. Fuel costs approximately the same as diesel in a filling station, sometimes more depending on the company. You can check the fuel costs before you leave and there's a meter at the helm of each boat to show how many hours you've travelled. Running the engine slower will use less fuel. The boats are fully insured against damage, although there is an excess with each boat equal to the refundable damage deposit. Please note that you, your crew or your belongings are not insured and you may need to take separate travel insurance for these items. You can get detailed information on getting to the marina HERE but a summary follows. Most of the companies that we represent provide a transfer service from Major airports to their marinas. Shared transfers take passengers from several flights and take them to marinas on the river, and these cost between €65 and €80 per person for the round trip (airport-marina-airport), and one way transfer are available for approximately half the price. More information on prices for transfers is available on each company page (go to the map page and click on the name of the hire company). Shared transfers are available on Saturday for most companies, and Wednesday or Friday may also be available depending on the time of year and the company in question. Private transfers are also available, prices on request. What time can I collect the boat, and what time do I bring it back at? The collection time with all of the cruiser companies is 4pm - this is to allow time for the boat to be cleaned and maintained from the previous crew. All of the companies try to get short breaks out at about 2pm and usually succeed unless the marina is very busy. The boat should be returned by 9am or 10am on the final morning depending on the company, again to allow time to clean and maintain the boat for the next crew. Everything that you need to live on board is provided on the boat. Fresh bed-linen and towels, all cutlery and crockery, cooking utensils etc. Every boat has at least one bathroom with shower, and from four berth up most will have two or more. There is a fully functional galley on board with a small cooker and oven/grill and a small fridge. Is there electricity on the boat? All of the boats have 12v cigarette lighter sockets for charging mobile phones or laptops, although you'll need to bring your own adaptor. Some of the larger boats have limited 220v outlets, and some have special low-voltage hairdryers, televisions and DVD players. Some companies will provide an inverter for 220v power. Is there Heating on the boat? All of the boats have warm air central heating that runs of it's own motor so there's no need to run the main engine to heat the boat. You'll need to run the main engine for hot water. Are life jackets and safety equipment provided? Life jackets are provided for crew members of all ages, and the marina staff will be happy to fit life jackets to children. Fire safety equipment is also on board - fire extinguishers and fire blankets. Not very fast. The idea of a Shannon River cruise is to relax and unwind, and most of the boats have a maximum speed of about 10Kph. All of the cruisers are fully equipped with everything you need to live on board - bed linen, towels, soap, toilet paper, a fully equipped galley with cooker and hob, all crockery and cutlery, a fridge. Life jackets are available for adults and children and fire extinguisher(s) and a first-aid-kit are on board. Most of the companies will supply a torch, binoculars and a dinghy. One thing we always recommend at Shannon River is that you take some extra towels if possible. You will of course have to provide your own food and drinks and optional recommended items include rubber-soled shoes for grip and soft luggage that stores easily (although most of the companies will store hard luggage for you on request). Which way to I go? Any direction you want within the limits of navigation. Bear in mind the times it takes to get from place to place, we've come up with some suggested routes to give you an idea of the best route for you. Do I have to pay to moor the boat? Although there are some private marinas that charge for mooring, there's free mooring at every town and village on the length of the Shannon and Erne waterways. There's a charge to moor at Athlone and this mooring is supervised. At busy times it's acceptable practise to moor alongside another boat if there are no free spaces. Your cruiser company will supply information on how to operate any locks that you come across. There are 16 locks on the Shannon Erne Waterway, all of which are automatic, and you will need a swipe card to use these locks. Swipe cards are available from your cruiser company, as well as from many shops along the waterway. These swipe cards can also be used to access facilities at harbours along the river, such as showers or laundry. Book a cruise of 3 nights or more on the Clipper or Magnifque from June to October and get 20% off.